Epstein–Barr virus (EBV) is a ubiquitous human γ-herpes virus infecting more than 90% of the population worldwide. EBV is associated with certain malignancies (e.g. Burkitt lymphoma, Hodgkin lymphoma and nasopharyngeal carcinoma). Recent studies have raised the possibility that EBV may also be involved in the pathogenesis of breast carcinoma, the most common carcinoma of females. If substantiated, this finding would have major implications regarding prevention and therapy of the disease. The studies published so far have employed diverse methods, however, and the results have been controversial. Using the EBV DNA PCR, EBV DNA in situ hybridisation and in situ hybridisation for the detection of the EBV-encoded RNAs, and using immunohistochemistry for the demonstration of the EBV-encoded nuclear antigen 1, we have studied a series of 59 invasive breast carcinomas for evidence of EBV infection. EBV-encoded RNA-specific in situ hybridisation and EBV-encoded nuclear antigen 1 immunohistochemistry were negative in all cases. Using the PCR, EBV DNA was detected in four out of 59 cases. These cases were further studied by EBV DNA in situ hybridisation, showing an absence of viral DNA from the tumour cells. These results indicate that breast carcinoma is not an EBV-associated tumour. Epstein–Barr virus (EBV) is a ubiquitous human γ-herpes virus infecting more than 90% of the adult population worldwide. EBV is associated with several malignancies (e.g. Burkitt lymphoma, Hodgkin lymphoma and nasopharyngeal carcinoma) and thus has been classified as a group 1 carcinogen . Several studies have recently hinted at a possible role for EBV in the pathogenesis of breast carcinoma, which represents the most common carcinoma of females in the Western world [2, 3]. If substantiated, this would have potential implications for the prevention and treatment of breast cancer. Immunotherapeutic strategies based on EBV-specific cytotoxic T cells are currently being developed for the treatment of EBV-positive Hodgkin lymphoma and nasopharyngeal carcinoma, and they could potentially also be applied to EBV-associated breast carcinoma [4–6]. Against this background, the possibility that EBV may be involved in the pathogenesis of breast carcinoma has received great attention. The first studies addressing this issue focused on medullary carcinomas since these are morphologically similar to nasopharyngeal carcinoma. However, these studies consistently failed to detect EBV in medullary carcinomas using various techniques [7–9]. The possibility that invasive ductal and invasive lobular breast carcinomas might be EBV-associated was raised by Labrecque and coworkers , triggering a large number of followup studies. However, the results and conclusions have been highly variable. It is generally accepted that EBV DNA can be detected in up to 50% of breast carcinomas using the PCR [2, 3, 10–13]. Results obtained with other methods are more difficult to reconcile. Studies using immunohistochemistry or in situ hybridisation have confirmed the presence of the virus only in a proportion of the PCR-positive cases [2, 3]. Moreover, EBV was detected only in a subset of tumour cells in some reports, raising questions regarding the possible role of the virus in breast carcinogenesis [10–12]. Using in situ hybridisation, focal expression of the small EBV-encoded RNAs (EBERs) was detected in tumour cells of some breast carcinomas [11, 12], while other studies have demonstrated a complete absence of EBER expression from breast carcinomas [14, 15]. Since the EBERs are expressed in all established EBV-associated tumours , the latter finding would appear to argue against an association of EBV with breast carcinomas. Nevertheless, expression of the EBV-encoded nuclear antigen 1 (EBNA1) has been detected by immunohistochemistry in a proportion of cases, and it has been argued that an EBER-negative form of EBV infection may be prevalent in breast carcinomas [3, 11, 16]. The evidence regarding a possible association of EBV with breast carcinoma is thus controversial and, in view of the high incidence of this tumour, requires clarification. Before undertaking a study of breast carcinoma, we felt it was important to establish criteria for the definition of EBV-associated tumours. The study of DNA extracts by PCR is clearly not satisfactory since it leaves unanswered the question of the cellular source of any viral genomes detected. This consideration also applies to Southern blot hybridisation, although determination of viral clonality is possible with this method, thus allowing conclusions regarding the clonality of the cell population harbouring the virus . Unequivocal localisation of the virus is best achieved by in situ techniques. Immunohistochemical methods are available for the detection of viral proteins in paraffin sections. However, some of these are not consistently expressed in latent EBV infection . Only EBNA1 is expressed in all known forms of viral latency, yet the antibodies available for the detection of this protein usually produce only weak staining. A lack of detectable EBNA1 expression thus cannot be taken as proof of absence of the virus [18, 19]. In recent years, in situ hybridisation for the detection of the EBERs has become the 'gold standard' for the detection of the virus because of its high sensitivity owing to the highly abundant expression of these molecules . The application of this method is based on the assumption that the EBERs are consistently expressed in EBV infection. Recent studies of hepatocellular carcinoma have raised the possibility of an EBER-negative form of viral infection . DNA in situ hybridisation can be used for the localisation of the viral genome . However, this method is prone to false-negative results due to the usually low copy number of the viral genome in latently infected cells. Based on these considerations, we decided to carry out a study of breast carcinomas employing a combination of methods. All cases were screened for the presence of EBV by EBER in situ hybridisation, by EBNA1 immunostaining and by EBV DNA PCR. Cases positive for viral DNA by PCR were in addition subjected to EBV DNA in situ hybridisation. Formalin-fixed, paraffin-embedded tissue blocks from 59 invasive breast carcinomas were retrieved from the files of the Institute for Pathology, Friedrich-Alexander University, Erlangen, Germany. These included 30 invasive ductal carcinomas, 26 invasive lobular carcinomas, two medullary carcinomas and one undifferentiated carcinoma. Among these 59 carcinomas, 50 cases were classified as grade 2, seven cases as grade 3 and two cases were identified as grade 1. The age of the patients ranged from 30 to 89 years, and all patients were female. For control, paraffin sections from EBV-positive, undifferentiated nasopharyngeal carcinomas were used. The plasmids harbouring inserts specific for the small EBV-encoded nuclear RNAs (EBER1 and EBER2) have been described previously . Single-stranded anti-sense and sense RNA probes were obtained from these plasmids by in vitro transcription in the presence of 35S-labelled UTP . EBER in situ hybridisation was carried out as described in detail elsewhere . In brief, paraffin sections were dewaxed and rehydrated through graded ethanols, treated with 0.2 NHCl for 20 min, digested with 0.5 mg/ml pronase (Boehringer, Mannheim, Germany) for 10 min, fixed in cold 4% paraformaldehyde for 20 min, and acetylated using a freshly prepared 1:400 solution of acetic anhydride in 0.1 M triethanolamine (pH8.0) for 10 min. Sections were then dehydrated through graded ethanols and air dried. Approximately 50 μl hybridisation mixture (50% deionised formamide/10% dextran sulfate/2 × standard saline citrate [SSC]/0.2 mg/ml yeast tRNA/10 mM dithiothreitol [DTT]), including 1 × 105 cpm labelled probe, were applied to each section. After hybridisation overnight at 50°C, sections were washed in 50% formamide/1 × SSC/10 mM DTT at 52°C for 4 hours. To remove nonspecifically bound probe, sections were subjected to RNase A digestion (Sigma, Steinheim, Germany; 20 μg/ml, 30 min, 37°C). Sections were then rinsed in 2 × SSC and 0.1 × SSC, dehydrated through graded ethanols and dipped into Ilford G5 emulsion (Ilford, Mobberley, Cheshire, UK). For the detection of EBV DNA, a plasmid harbouring the BamHI W internal repetitive fragment of the EBV genome was used . Total plasmid DNA was labelled with 35S-dCTP by nick translation using a commercially available kit (Amersham Pharmacia Biotech, Freiburg, Germany). Following the nick translation reaction, labelled DNA was separated from unincorporated nucleotides using Sephadex columns (Nick columns; Amersham Pharmacia Biotech) according to the supplier's instructions. Prehybridisation treatment was essentially the same as for RNA in situ hybridisation, with minor modifications as described previously . Approximately 50 μl hybridisation mixture (50% deionised formamide/10% dextran sulfate/2 × SSC/30 μg/ml herring sperm DNA/10 mM DTT) containing 40–50 ng/ml labelled probe were added per slide. Sections were covered with siliconised coverslips. Probe and cellular DNA were denatured by placing slides onto a 90°C heat block for 3 min. Hybridisation was carried out overnight at 37°C in an atmosphere of 50% formamide. Slides were washed in 50% formamide/0.1 × SSC/10 mM DTT at 37°C for 4 hours, followed by 2 × SSC/10 mM DTT and 0.1 × SSC/10 mM DTT, both for 30 min at room temperature. Sections were dehydrated through graded ethanols, air dried and dipped as already described. For the detection of EBERs and EBV DNA, sections were exposed at 4°C for 3–12 days. Paraffin sections were dewaxed in xylene for 30 min at room temperature and rehydrated through graded ethanols (5 min each in 100%, 96% and 70% ethanol and water). The EBNA1-specific rat monoclonal antibodies, 1H4 and 2B4, were kindly provided by Elisabeth Kremmer, Munich . Bound primary antibodies were detected using a biotinylated rabbit antiserum specific for rat immunoglobulins, streptavidin biotinylated peroxidase complex ABC–PO and a tyramide signal amplification protocol followed by detection of precipitated biotin using alkaline phosphatase-labelled ABC (all Dako, Hamburg, Germany). Fast Red (Sigma, Steinheim, Germany) served as a chromogen. For PCR, one 10 μm paraffin section from each case was dewaxed in xylene for 30 min at room temperature, rehydrated through graded ethanols (5 min each in 100%, 96% and 70% ethanol) and air dried. Tissues were incubated in 200 μl buffer (50 mM KCl, 10 mM Tris-HCl [pH8.3], 2.5 mM MgCl, 0.1 mg/ml gelatine, 0.45% NP-40, 0.45% Tween-20) and 0.2 mg/ml proteinase K overnight at 56°C, followed by heat inactivation of proteinase K.
Five microlitre aliquots of DNA extracts were subjected to PCR: 5 min denaturation at 94°C, 10 cycles of 20 s at 94°C, 20 s at 58.3°C and 30 s at 72°C, followed by 25 cycles of 20 s at 94°C, 20 s at 53.3°C and 30 s at 72°C, completed by 150 s at 72°C. The reaction volume was 50 μ l containing 5 μ l DNA, 1 × polymerase buffer, 1.5 mM MgCl, 200 μ M dNTP, 1 U Taq-polymerase and 400 nM primer mix (5'-CAC TTT AGA GCT CTG GAG GA-3' and 5'-TAA AGA TAG CAG CAG CAC AG-3'). The primers resulted in the amplification of a 153 base pair fragment of the EBV BamHI W internal repetitive fragment. For control, a 303 base pair fragment of the β-globin gene was amplified using published primers. The PCR products were analysed by electrophoresis using 2% agarose gels. All cases were first subjected to in situ hybridisation for the detection of EBER expression using 35S-labelled probes. In breast carcinomas, rare EBV-infected lymphocytes were detected in the stroma of one case (Fig. 1a). However, there was no detectable EBER expression in the tumour cells in any of the 59 cases (Fig. 1a). By contrast, expression of the EBERs was readily detectable in tumour cells of undifferentiated nasopharyngeal carcinomas (Fig. 1b). All cases were then examined for EBNA1 expression by immunohistochemistry using two previously described rat monoclonal antibodies, 1H4 and 2B4 [18, 19]. Again, nuclear staining typical of EBNA1 expression was not observed in any of the breast carcinoma cases (Fig. 1c). EBNA1 expression was detected in nasopharyngeal carcinoma control sections using this approach (Fig. 1d). In situ detection of Epstein–Barr virus (EBV) in breast carcinomas. 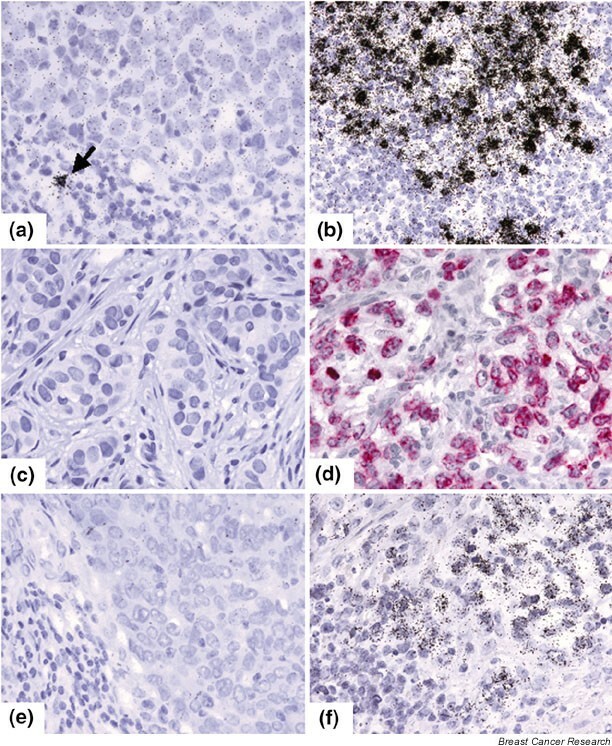 In situ hybridisation with 35S-labelled RNA probes shows (a) an absence of expression of the EBV-encoded RNAs (EBERs) in a breast carcinoma (note an isolated EBER-positive lymphocyte in the tumour stroma; black grains, arrow), while (b) tumour cells of a nasopharyngeal carcinoma show a strong nuclear labelling indicating EBER expression (black grains). Immunohistochemistry reveals (c) an absence of detectable expression of the EBV-encoded nuclear antigen1 (EBNA1) in a breast carcinoma and (d) the expression of EBNA1 in most nasopharyngeal carcinoma cells (red nuclear staining). Using DNA in situ hybridisation with 35S-labelled probes, (e) an absence of EBV from breast carcinoma cells is demonstrated while (f) EBV DNA is detected in tumour cells of an undifferentiated nasopharyngeal carcinoma (black grains). The possibility of an EBER-negative form of latent EBV infection has recently been suggested . Also, immunohistochemical detection of EBNA1 is not very reliable and the absence of a specific staining does not definitely exclude the possibility of EBNA1 expression. For these reasons, experiments were carried out aimed at the detection of the viral genome. First, DNA extracts from paraffin sections of all cases were subjected to PCR using primers specific for the BamHI W fragment of the EBV genome. After 35 amplification cycles, a PCR product of the expected size was observed in four of 59 cases (6.8%; data not shown). Subsequent analysis of the EBV DNA PCR-positive cases by EBV DNA in situ hybridisation using a 35S-labelled probe specific for the EBV BamHI W fragment yielded negative results (Fig. 1e), while the same approach led to a strong labelling of nasopharyngeal carcinoma cell nuclei (Fig. 1f). In keeping with previous reports, we show that EBV DNA can be detected in a proportion of breast carcinoma samples by PCR [2, 3, 12, 13]. The significance of this finding crucially depends on the localisation of the virus and, in this respect, published evidence is controversial. Using a highly sensitive in situ hybridisation method, we show that the EBERs are not expressed in breast carcinoma tumour cells while EBV-infected lymphocytes were occasionally detected in the tumour stroma. This is in agreement with recent EBER in situ hybridisation studies of breast carcinomas [14, 15]. Expression of the EBERs has been detected in all known virus-associated tumours and has become the standard method for the detection of EBV infection. However, the possibility of an EBER-negative form of EBV infection has recently been raised [3, 20]. To address this problem, we have looked for the expression of another viral gene product, EBNA1. The presence of EBNA1 in EBV-infected cells is required for the maintenance of the EBV episome, and thus EBNA1 should be expressed in all proliferating EBV-infected cells . Indeed, using immunohistochemistry, EBNA1 has been detected in EBV-associated nasopharyngeal and gastric carcinomas . However, there was clearly no EBNA1 expression detectable in our breast carcinoma cases, while appropriate controls were positive. This is in marked contrast to other studies using a similar approach [3, 16]. The difference between the present study and these other reports is likely to be due to technical reasons. Most importantly, it has been demonstrated previously that one of the EBNA1-specific antibodies used in the present study and in other studies, clone 2B4, is prone to produce nonspecific nuclear labelling of EBV-negative cells . The detection of both EBERs and EBNA1 rests on the active expression of the viral genome. Since it is conceivable that the viral genome may be present in an entirely silent form, we have also examined our cases for the presence of viral DNA. By PCR, we show that only a small proportion of breast carcinoma samples carry detectable EBV DNA. In situ hybridisation analysis of these cases showed that the tumour cells in these cases were EBV-negative. In agreement with a previous study, the present results suggest that EBV DNA detected by PCR in breast carcinoma tissues is likely to relate to the presence of EBV-infected lymphocytes in the tumour stroma and does not indicate infection of the tumour cells with the virus . These results provide no evidence for an involvement of EBV in the pathogenesis of breast carcinomas occurring in German patients. We have previously demonstrated that squamous cell nasopharyngeal carcinomas are regularly associated with EBV in Hong Kong, while only approximately 30% of cases from Europe and central China are EBV-positive . Theoretically, the possibility thus remains that breast carcinomas may be associated with EBV in other geographical areas. The present results strongly argue against a direct role for EBV in the pathogenesis of breast carcinoma. Breast carcinomas should not be regarded as EBV-associated tumours. This work was supported by a grant from the Wilhelm Sander Foundation. The authors are grateful to Renate Lisner for excellent technical assistance.